Over the years, the outward appearance of Blyth has changed greatly, and the market area is no exception; however the support and intentions of the market have remained the same. Even as late as the early twentieth century this area of what we know as Blyth was not considered so, it belonged to the Cowpen district until 1907 when the Blyth and Cowpen districts merged; with Waterloo Road not being named so until the 1880’s. Previously it was merely Waterloo. Where the market place stands today was once a general purpose hall; in 1857 the Central Hall was constructed primarily for music, a kind of auditorium. Photos from the mid 1890’s show that the hall stood directly in front of where the Westgate Department Store stands today. The market place itself was run by the Central Hall, it was considerably smaller than the size it is today. The Central Cinema had an impressive 1400 seating capacity, and was one of 4 cinemas that Blyth has boasted over the years. The central cinema was the oldest cinema in Blyth, and was multi-purpose; it housed Martin’s bank on the Waterloo Road side, and Baird’s butchers on the Market Street side. The building backed onto Zion Methodist Church. The cinema had what were called ‘courting seats’ which were very popular; couch seats that had no arm rest in the middle. A fountain stood to the front of the cinema, as did a seating area with separated grassy areas with flowers. The market stalls stood to the front and to the Market Street side of the cinema. St Mary’s Church is located at the west end of the market place. A chapel of ease was constructed in 1864 and becomes a Parish Church in 1897. The market place was not always a pedestrian area, the paved area in front of the current Keel Row used to be a road (Turner Street) that connected Waterloo Road to Regent Street, so the whole market area was accessible by car. The road was only paved over around 1983. It boasted one of the early street lamps, that didn’t last long however as it was deemed too high, and the light not bright enough. In front of where the Keel Row stands, there used to be a police cabin, and a public telephone box. In the corner of the market place, there was a statue erected in honour of John Hedley in 1880. He was a well known business man and a founder member of Blyth Local Board in 1863, he was also a leading figure of the Waterloo Presbyterian Church. It is made of cast iron, and due to it’s location and design, became a place for public debate and formal speeches. The Keel Row only appeared in 1991, previously it had been a number of different buildings! 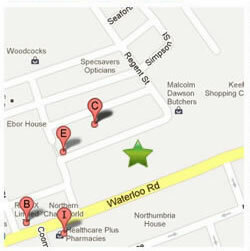 There was a row of shops that connected where Greggs is now and the butchers. In fact, Greggs of Gosforth has always been in that general area, although Burtons is the only shop there to have remained under the same ownership. Behind here, where the car park is today, stood the Theatre Royal that was built in memory of Arthur Jefferson, father of Stan Laurel. This was built after the Octagon Theatre burnt down in 1875. It was demolished sadly to make room for the car park in the 1980’s despite pubic protest and an attempt to get the building listed. The market square has had its fair share of catastrophes! It was believed that Blyth was ‘fire-stricken’. On the 16th October 1904 a terrible fire destroyed 9 businesses and 3 offices on Waterloo Road, the buildings were rebuilt but at a cost of £30 which is equivalent to over £2,500,000. 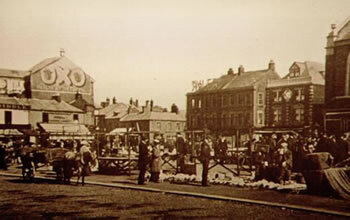 In 1900 Blyth Town Centre was immensely flooded, to the point where you could swim at the market. The easterly wind created havoc; after 24 hours the water had subsided, but it was still high enough to wade in. And again in 1915 the people in Blyth Market Place had put their lives in danger, as hundreds gathered to watch the over head German Zeppelin. As expected, the shops around the market place have been consistently changing, and/or going out of business. Woolworths has been in Blyth since the early Nineteenth century but was forced to close down in 2009 when the company went into administration. Perfect Homes now stands in its stead. It saddened many to see this iconic shop close its doors on Blyth after 70 years of trading. It had originally opened as a 3d + 6d store, with a staff of over 50 at its peak. It was a shop that changed with the times, at one point selling biscuits, cakes and groceries. The infamous cobblers, on the corner of Market Street and Regent Street, was once the Boot Company. Where Iceland stands today, there used to be a pub called the Market Tavern. Different factors always come in to the success or failure of a shopping venture, but the general trend of the market is that it is no longer as popular as it once was. Compared to the mid twentieth century, and even the turn of the twentieth century, there are less stalls, and less shoppers; this can be seen in a photo taken quite recently on the 25/10/2011, a market Tuesday, there were absolutely no stalls. Photos of the early 1900’s show that wooden stalls were erected, although few had cover, and many of the items for sale were laid on the ground. By 1960 the market place was far busier, and all of the stalls had covers by then. In more recent times, the market has undergone a spectacular change. It took 10 months, in 2009, and £3 million, but the re-vamp was worth it. The ‘quality regeneration scheme’ used a design by Simon Watkinson for the Market Place. There is a structure at the bottom of the market which is an integrated architectural and lighting artwork that was commissioned by Inspire Northumberland, called Hyperscope. This sits inside a 7.5m structure made of solid granite and has inside a changing light pipe which gives quite a dramatic look. Another design discussed was by architect Lindsay Duncanson which was more minimalistic; no seating, it had tall thin lights and a kind of reflective flooring. If you have the privilege of flying over the market place, you can see BLYTH spelt out in Morse code. There has been some debate over whether this is just a myth, but a quick Google search finds the photographic proof. Blyth’s market place has been the home to some of the town’s most important buildings, and has possibly seen the most change of the area. The buildings and roads around may have changed, but the market aspect has remained the same in one form or another for hundreds of years, and hopefully for years to come!